This is a good reminder post for people. As a lazy programmer, I always put images in the “grapics” folder at the root level and use absolute (“/”) paths. Much easier for me. 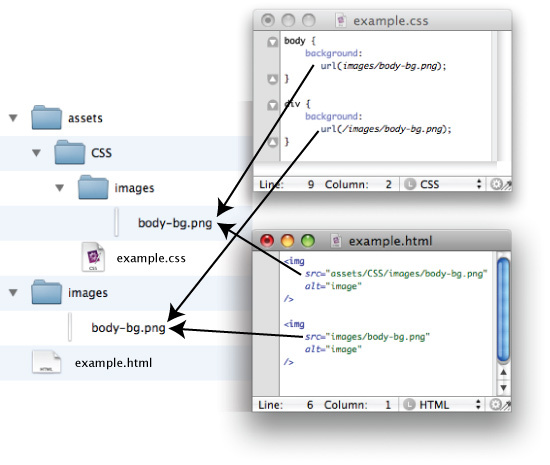 If you donâ€™t know how to construct unique path, use /assets/CSS/images/body-bg.png, where / means root of your server. PS: Great blog, keep it up. But it would be very helpful if you made a difference between code and pre. My comment will be much nicer to read when you do that. Thanks. “//website.com/images/image.gif” uses the protocol of a current page. This works fine if you are using absolute paths, so your path could be “http://website.com/images/image.gif”, “https://website.com/images/image.gif” or something else. and one more “./” uses the current directory. I am probably the laziest coder by usually putting all the images in the same folder as the html files, I now use a graphics folder. slightly off topic but if this tip does not work and the images are still not showing up, it can be that they are not saved right in photoshop and are ‘Index format’. Thank you for your idea, but i prefer my css-folder as root, too. Great reminder. Sometimes we do so much, when there’s a problem, we tend to think it has to do with something more in-depth and less complicated then the mere file path. Oh my! The simplest of issues are always the biggest problems … Thank you for this post! In paths article, says privative rather than primative. Figgered you’d wanna know.